It was a glorious Sunday afternoon in the middle of August as we approached the Cliffs of Moher. Upon approach, the cliffs appear to be plains of luscious grass that seemingly extend without end into the horizon. Given a closer look, the rolling fields are actually plateaus atop majestic, sheer cliffs that plunge into the Atlantic Ocean seven hundred feet below. 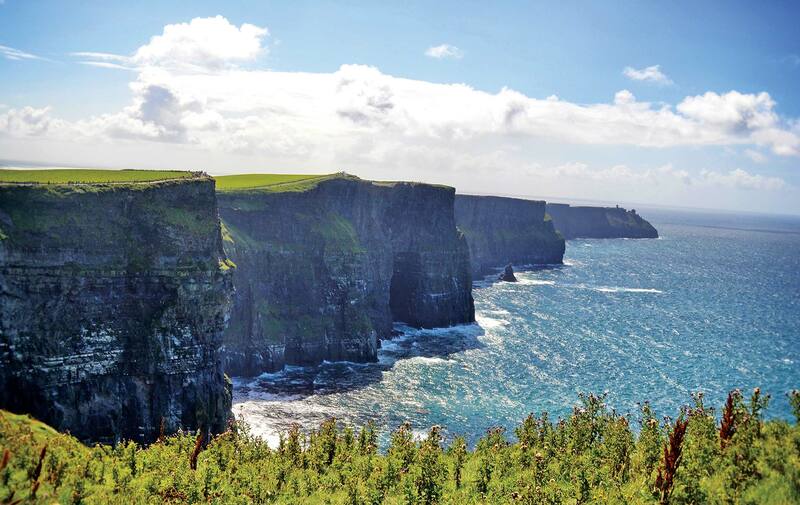 Aside from being Ireland’s most-visited natural attraction, the cliffs are one of the many beautiful locations that were used during the filming of the classic movie The Princess Bride. Not a bad introduction to the endless natural beauty that Ireland has to offer! This past August, I traveled for the first time to magical Ireland. I had heard the many usual descriptions of the country; among the most common were that it rains a lot, it is very green, and there are a lot of sheep. However, having no real idea of the Emerald Isle and its many wonders, I was unprepared to have my heart so completely captured. Surely I am not the first to claim such a fantastic outlook as a result of experiencing this extraordinary place. The purpose for the transatlantic trip was multifaceted, but the primary focus was the grand opening celebration of the new corporate office for The Idea Boutique, Ltd. in Clifden, County Galway, the first expansion venture of its kind for the Northwest Florida–based parent company, Cornerstone Marketing and Advertising, Inc. – The Idea Boutique®, located in Grayton Beach. This past March, Cornerstone enjoyed its twentieth anniversary in the marketing, advertising, and public relations industry. Also in 2014, Cornerstone, as the owner and publisher of VIE, marked its sixth year in the publishing business. In recognition of the office opening in Ireland, as well as the company’s twentieth anniversary, owners Lisa and Gerald Burwell invited office staff, family, and friends to join them for a weeklong celebration set in the rugged beauty of the Connemara region. 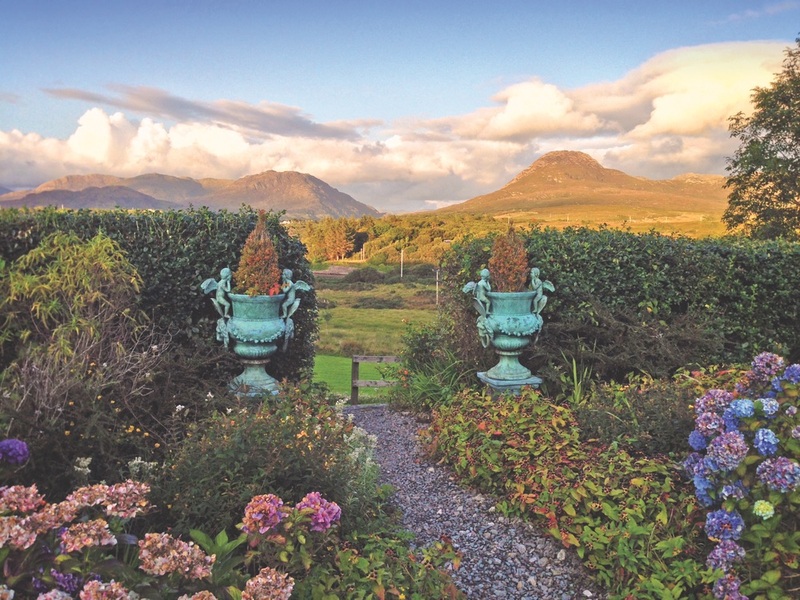 Owners Lisa and Gerald Burwell invited office staff, family, and friends to join them for a weeklong celebration set in the rugged beauty of the Connemara region. The details for the summer jaunt were meticulously planned months in advance, ensuring not only that the U.S. staff got a thorough introduction to the country and culture but also that The Idea Boutique’s presence in Ireland properly represented the high-quality standard of how it does business. The trip’s main scheduled events included a fantastic two-day stay at the luxurious five-star Ashford Castle Hotel; a five-night stay in the charming nineteenth century Rosleague Manor Hotel, which played host to a live painting exhibition featuring the sculptural painting style of Highway 30A–based artist Justin Gaffrey; a Downton Abbey–themed dinner at the amazing four-star Ballynahinch Castle Hotel; and a walkabout during the annual Connemara Pony Show in Clifden, the largest Connemara pony show of its kind in Ireland. In between the focal events, partakers were invited to explore the local beauty: Diamond Hill in Connemara National Park; the incredible Victorian architecture and grounds of Kylemore Abbey and the Victorian Walled Garden; and the breathtaking views and panoramas along Sky Road, to mention a few. 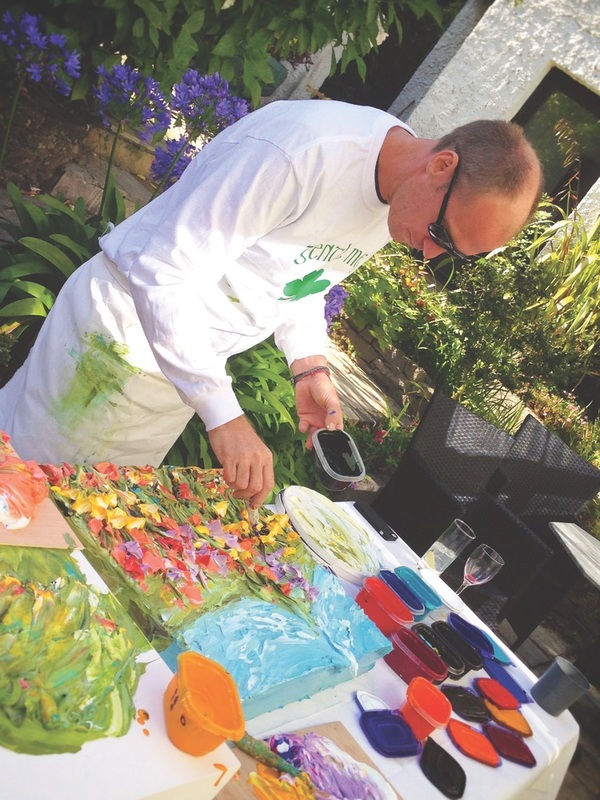 Northwest Florida-based artist Justin Gaffrey, a client of The Idea Boutique, was featured at Rosleague Manor Hotel on August 19 with a live painting exhibition and reception in the conservatory. Photo by Tracey Thomas. 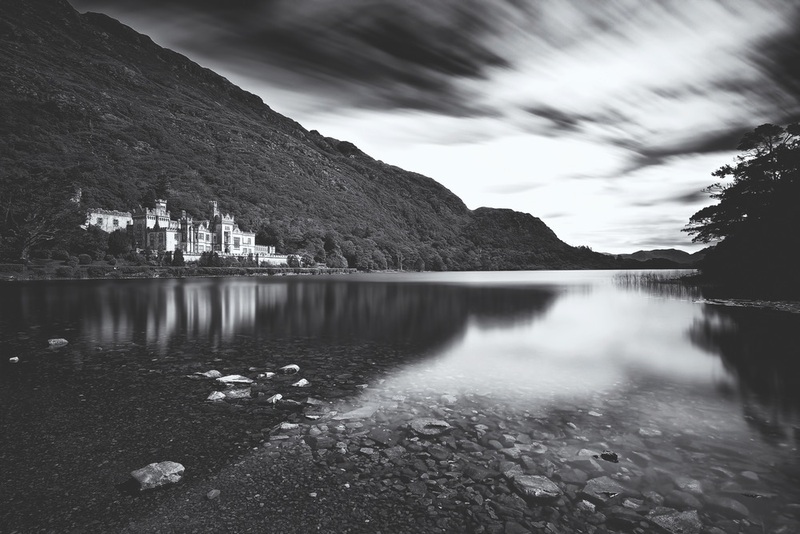 Leaving the Cliffs of Moher in the Burren region of County Clare, we headed to our first hotel—the stunningly beautiful Ashford Castle in Cong, County Mayo. Aside from the obvious challenges of learning to drive on the opposite side of the car and the opposite side of the road, the roads leading there were dizzyingly curvy and extremely narrow, and I had to avoid a few sheep crossing the road every now and then. But after adapting to these challenges, I found it rather fun to drive. 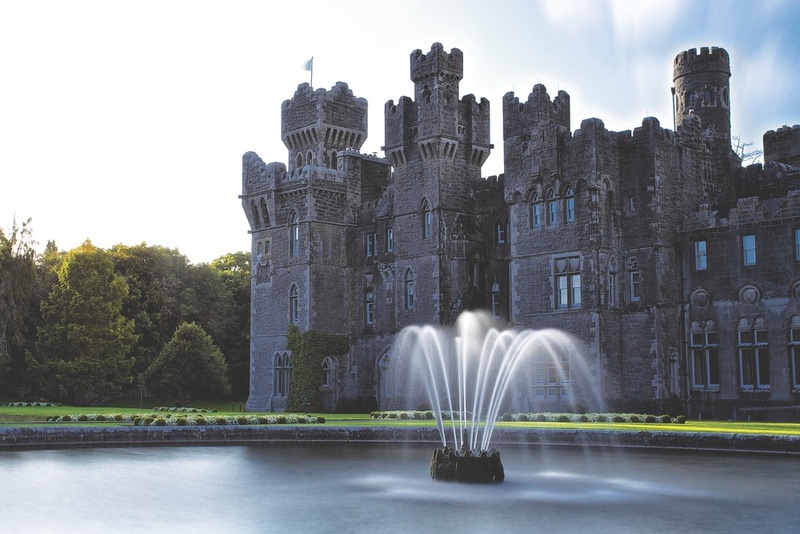 The medieval Ashford Castle is a piece of Ireland’s rich history, offering the traditional country pursuits of the gentry such as falconry, horseback riding, fishing, and clay pigeon shooting, which some of us tried for the first time. So cool! The next day (Monday), it took about an hour to drive to our next destination, Rosleague Manor Hotel, which overlooks Letterfrack Harbour at the head of Ballynakill Bay. Our hostess, Loretta Joyce, who has worked at the manor for over thirty years, graciously escorted us to our rooms, which were each unique in layout and furnishings. 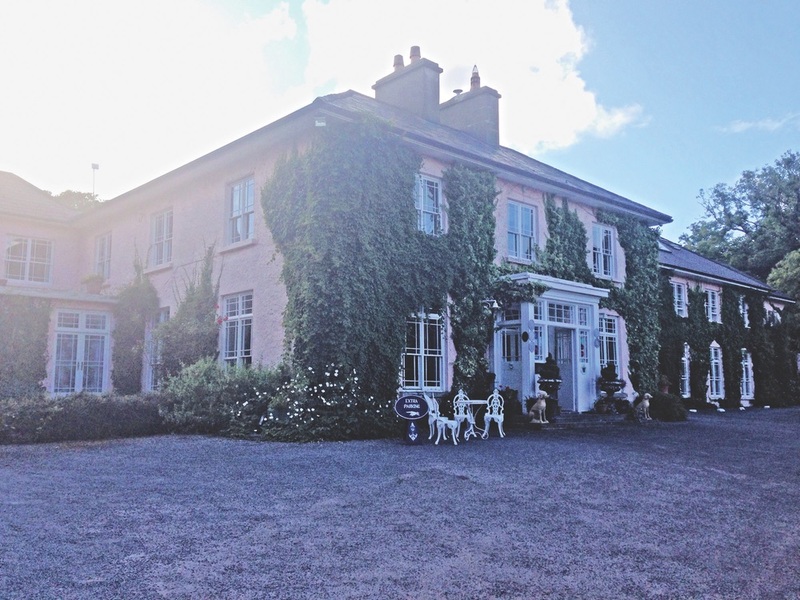 Rosleague Manor made a cozy home for the remainder of our stay and its location was convenient to all of our scheduled activities and explorations of Connemara for the next several days. 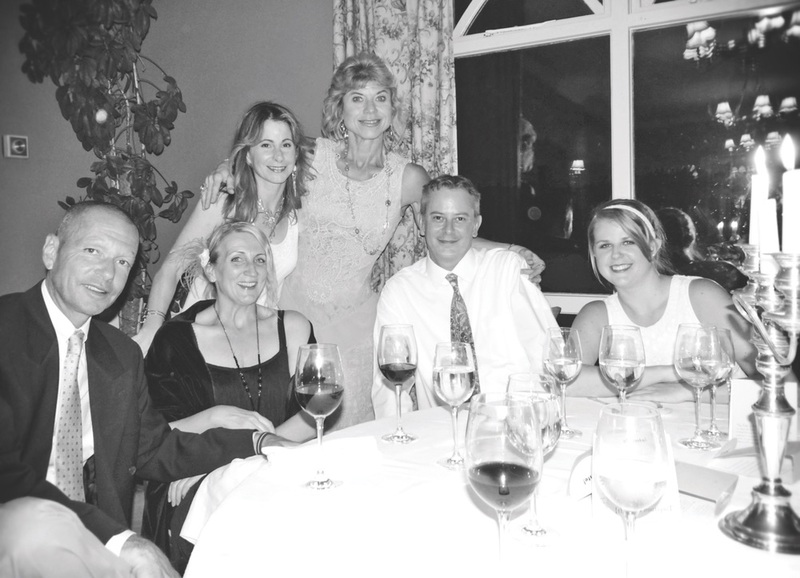 Hotel proprietor Mark Foyle made everyone feel at home and was always happy to help his staff manage our large group during early breakfasts, happy hours, dinners, and late-night gatherings. Tuesday afternoon. Another beautiful day with a brilliant sun and blue skies—a perfect day for Justin Gaffrey’s art exhibit in the glass conservatory lounge/bar at Rosleague. Justin Gaffrey Studio and Gallery, a client of The Idea Boutique, was thrilled to debut Justin’s work to Ireland. Among attendees were Justin’s fellow travelers and local artists, as well as some avid Facebook followers of his work—yes, all the way over in Ireland. In just short of an hour, using his trademark palette knife and scoops of brightly colored acrylic paint, Justin sculpted a beautiful Connemara landscape inspired by his recent explorations of the local countryside. The show was festive and introduced many to Justin’s unique style. The painting is now on display at The Idea Boutique office just in time for the 37th Annual Clifden Arts Festival in mid-September. Emma, Amanda, Bobby, and Laurie Ryan Crowley; Tom and Christine Ryan; Jerry and Carmel Ryan; Gerald and Lisa Burwell; David, Anne Marie, and Oscar Newell; and Marianne Ryan Duffey. 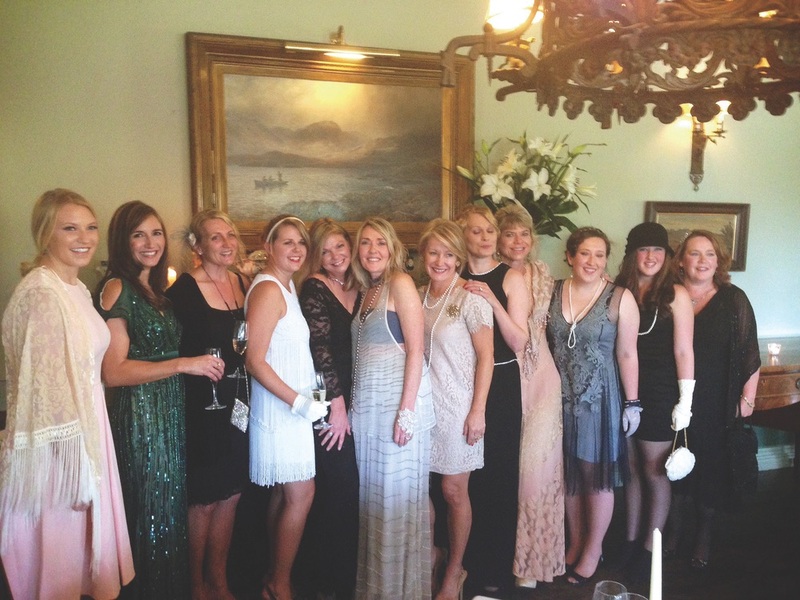 Wednesday evening was the big night everyone was anticipating—The Idea Boutique’s Downton Abbey–themed dinner party at Ballynahinch Castle—a formal dinner for almost thirty guests including clients, staff, friends, and family, all in our best 1920s-inspired dress. The setting was magical. The evening sun cast a golden hue into the beautiful Victorian-era Owenmore Restaurant, which has gorgeous unobstructed views of the babbling Owenmore River. Three large tables were exquisitely set with fine linens, flowers, silver period candlesticks, silver flatware, pristine stemware, and fine porcelain dinnerware. Guests were welcomed with beautiful place cards at their seats; these were graciously printed and donated by Rob and Laurie Crowley of Savron Graphics, Peterborough, New Hampshire. The Gaelic word Sláinte (a salutation or toast that literally means “Health”) headed the top of the folded card with the evening’s program and menu listed inside. 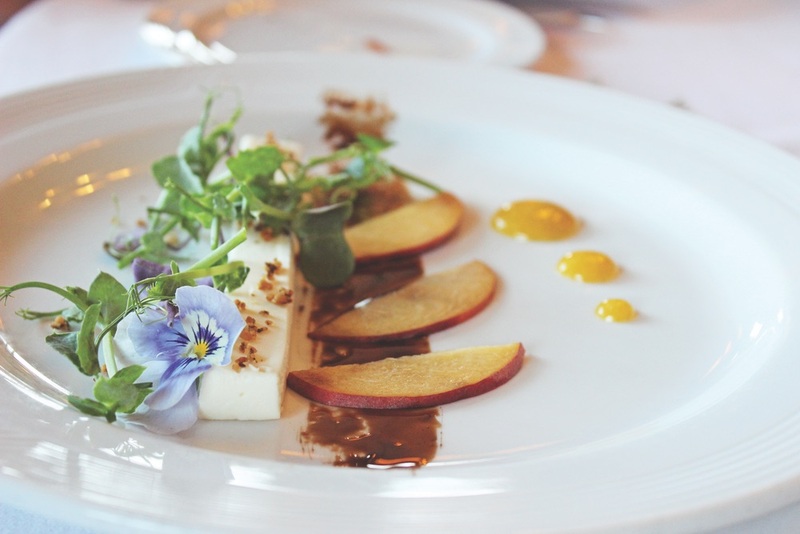 The food was prepared to perfection by the chefs and flawlessly served by an impeccable waitstaff. Immediately following dessert, all the guests retired to a gorgeously appointed drawing room with a roaring fire—even in August, Ireland can have a nip in the air. Here, Emma Crowley beautifully performed a soulful solo of “The Fields of Athenry”—a song that her late grandmother, Marie Ryan, had taught her seven years earlier. 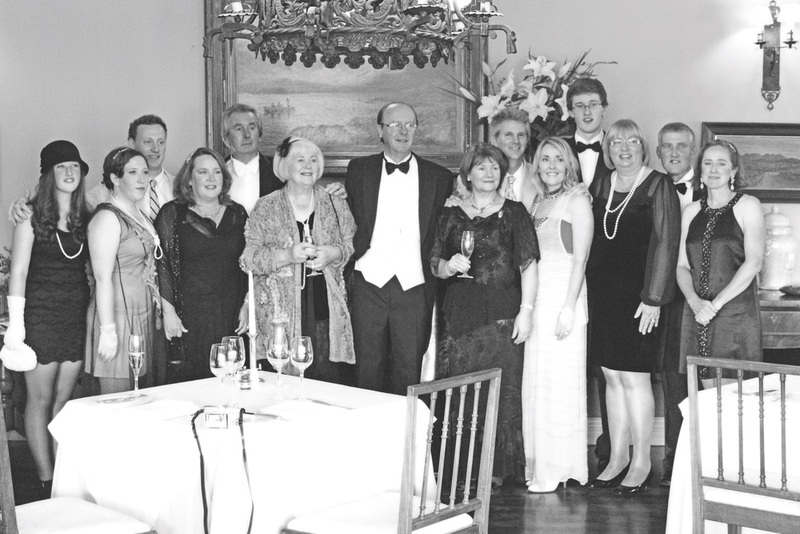 The Idea Boutique made quite an impression on Ireland this night—it was a truly magical evening! The setting was magical. The evening sun cast a golden hue into the beautiful Victorian-era Owenmore Restaurant, which has gorgeous unobstructed views of the babbling Owenmore River. Thursday was a beautiful Irish day—which is any day that the sun shines, even if it rains. And it did rain a little that day, though it wasn’t bad enough to bring spirits down. 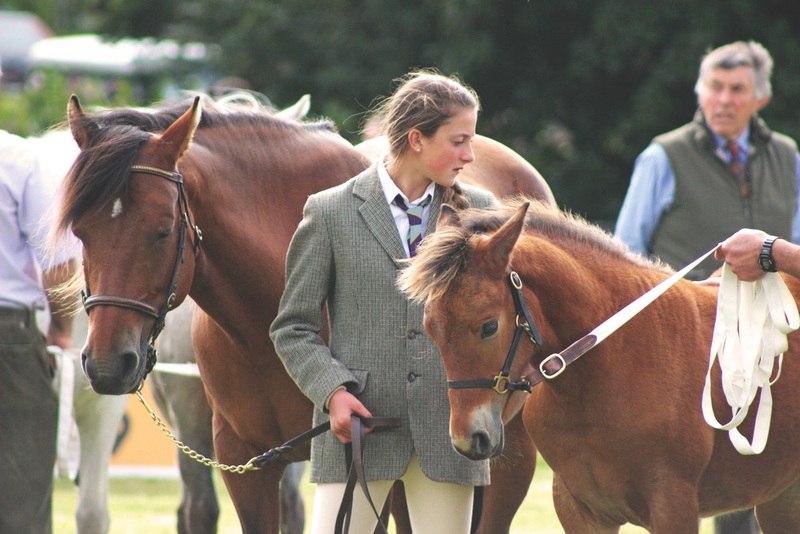 It was time for the Connemara Pony Show, which takes place annually at the Connemara Pony Breeders Society Show Grounds in Clifden, a short walk from the new office of The Idea Boutique, Ltd. 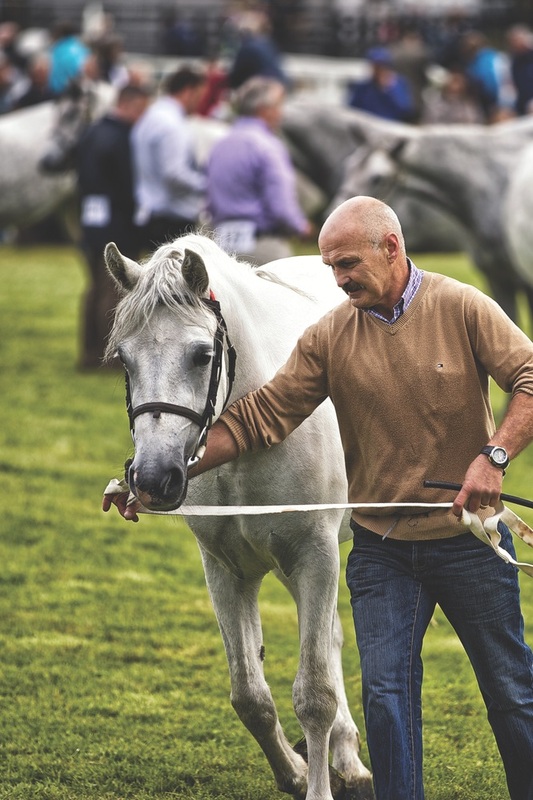 The Connemara Pony Show features the crème de la crème of Connemara ponies from throughout Ireland; this beautiful breed takes its name from the surrounding area, the land of its origins. 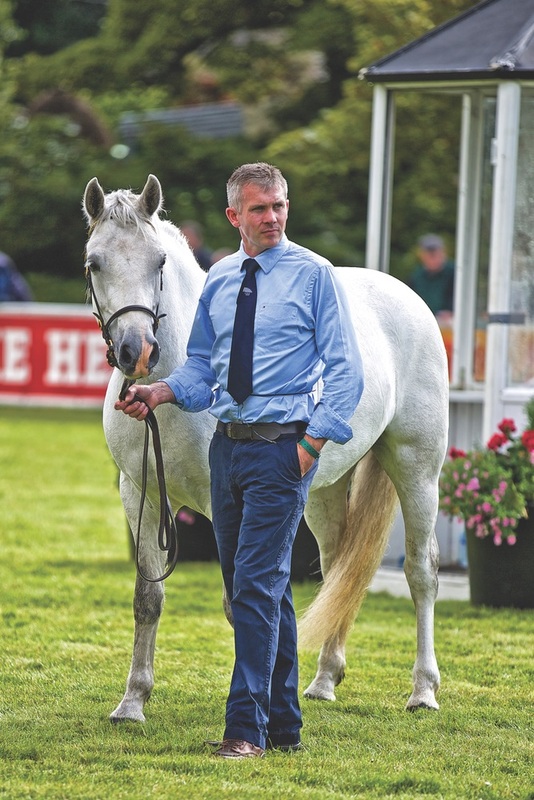 One of this year’s competing ponies, being walked by local breeder/trainer Geoffrey Heanue, was the Burwells’ own Gentle Meghan, a three-year-old filly making her show debut. The show buzzed with members of the community and world travelers exploring the grounds and enjoying the ponies on display. Among the showgoers was the famed John McLoughlin, Gentle Meghan’s breeder. 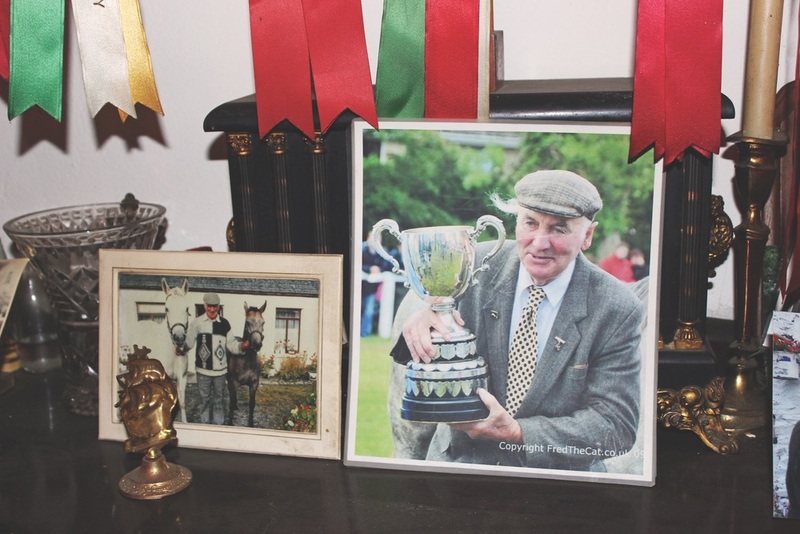 John is one of the most well known breeders of champion Connemara ponies in Ireland, and he has been a good friend and neighbor of Lisa’s extended Irish family for many years. Some women, dressed to the nines in wild hats and colorful dress, were vying to win the “Best Dressed” contest. 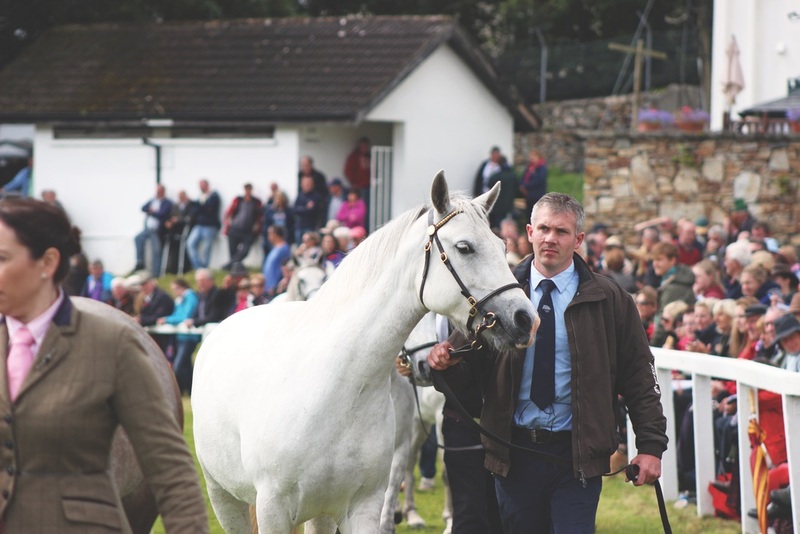 The entire Cornerstone staff was there to support Gentle Meghan and to take in the sights and sounds of one of Ireland’s biggest horse shows of the year. 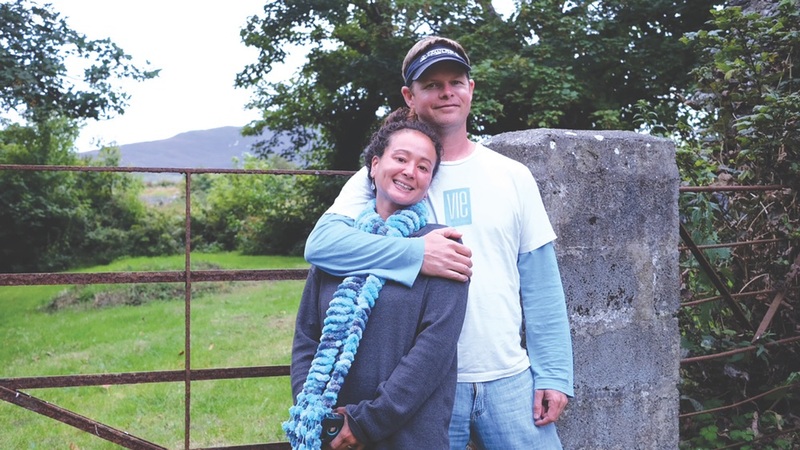 During the show, Lisa Burwell and Justin Gaffrey were interviewed by local radio station Galway Bay FM to talk about how the American-based Idea Boutique plans to become a part of the Connemara community. Thursday was a beautiful Irish day—which is any day that the sun shines, even if it rains. And it did rain a little that day, though it wasn’t bad enough to bring spirits down. Friday—the final full day before departing Ireland to head back to Florida. It was another sun-blessed day that was spent exploring more of the natural wonders of the area. 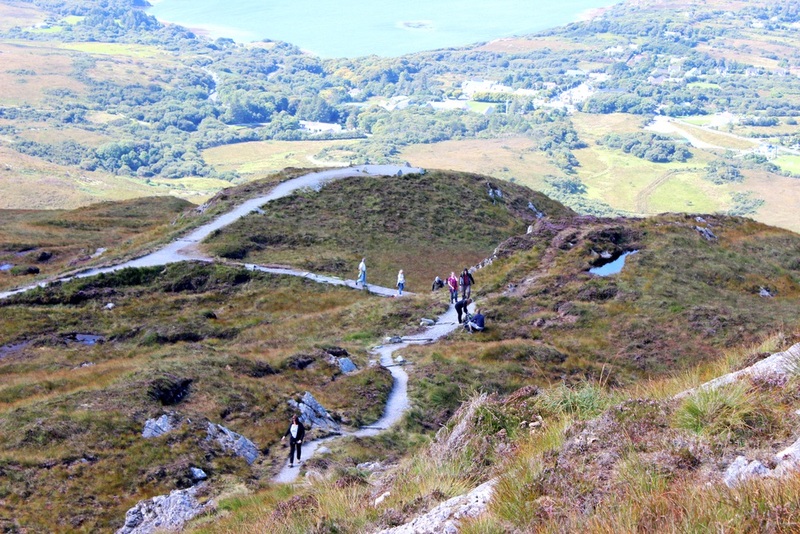 We took an exhilarating hike up Diamond Hill in Connemara National Park. 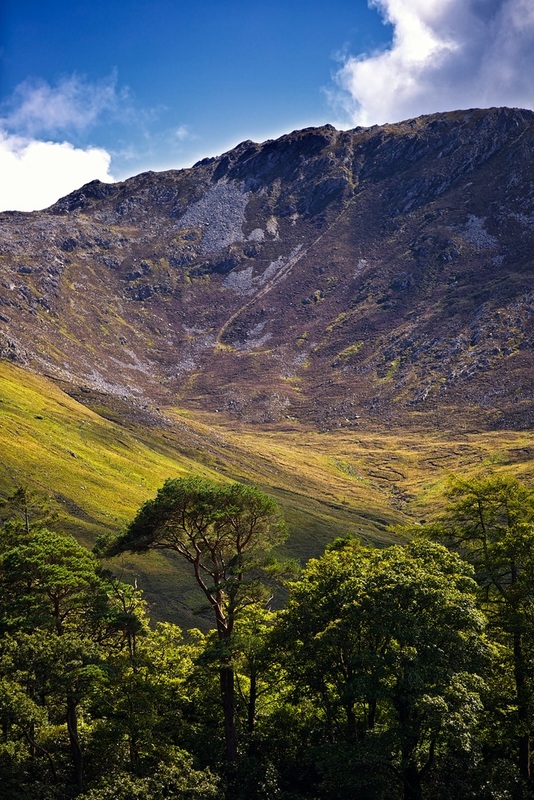 Inside the park, the natural Connemara landscape is wild and, for the most part, looks relatively untouched by humans. 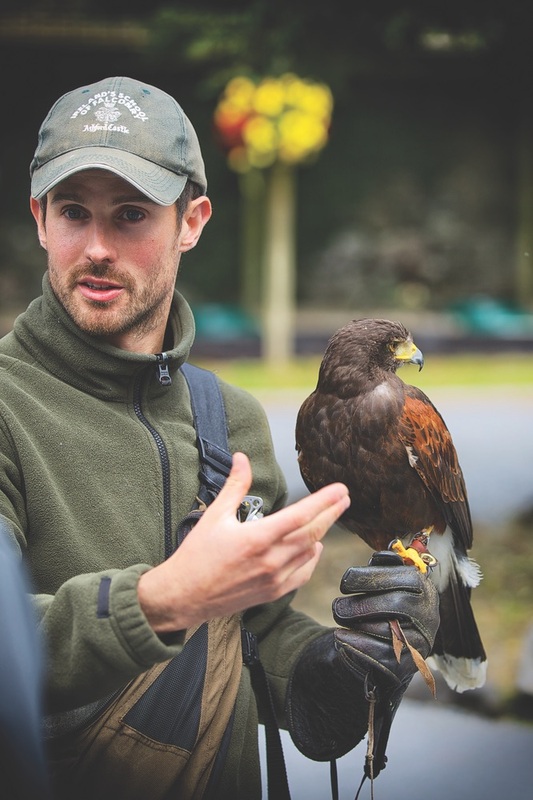 The national park, a highlight of the trip for many of us, is a gorgeous asset to the country and offers people a wonderful connection with the natural wonders of Ireland. And entry is free! The evening sun cast a golden hue into the beautiful victorian-era Owenmore Restaurant, which has gorgeous unobstructed views of the babbling ownemore river. By the end of the trip, I came to understand why Lisa and Gerald love Ireland so deeply. 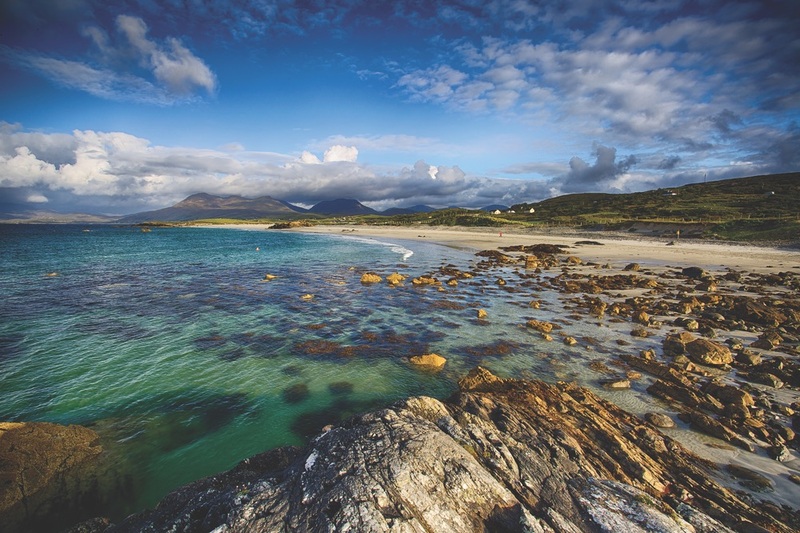 Lisa has a long history with the island country, as her mother grew up there, and Lisa spent one glorious summer exploring Connemara as a teenager with her younger sister Laurie. She remembers the land as being magical and stunningly beautiful—nothing has changed about that. It is a country that now possesses a special place in my heart. 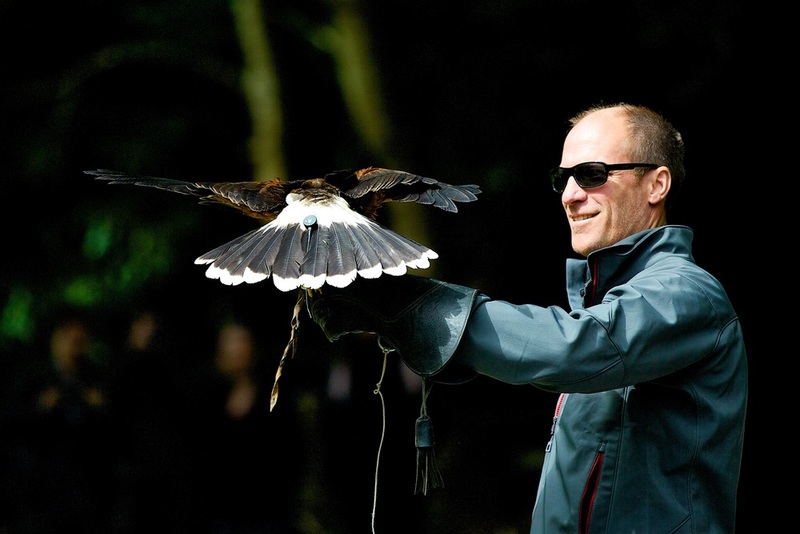 Ireland and its good-natured citizens have forever changed me. I was able to witness many hospitable, community-oriented, open, happy, and extremely friendly people. It was wonderful! Sadly, I have never experienced a communal vibe like this anywhere in the United States. I feel changed by what I experienced there, and I’m excited to know that The Idea Boutique will become part of such a wonderful country. I was able to witness many hospitable, community-oriented, open, happy, and extremely friendly people. It was wonderful! 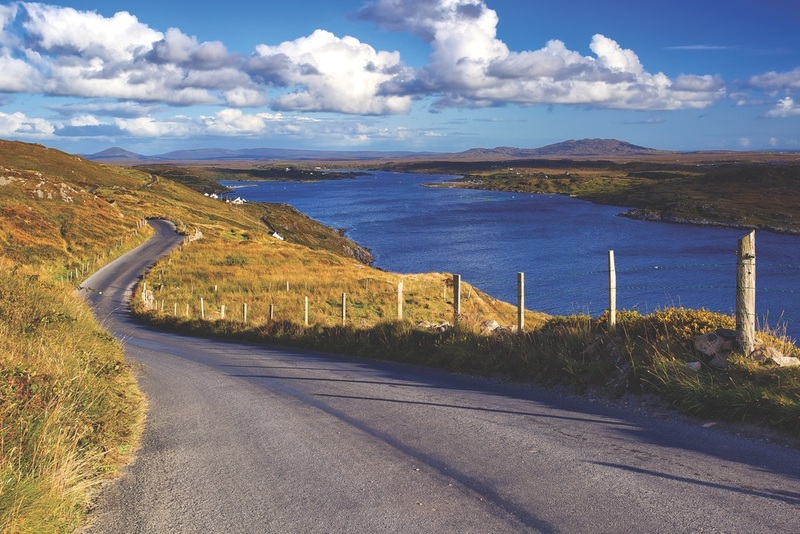 With marketing, advertising, and publishing ventures both in America and Ireland, The Idea Boutique aims to bring its marketing expertise together with a love for Ireland in hopes of contributing to the business community of Clifden and the surrounding area. The company’s vision is to attract more Americans to visit the country by showcasing its incredible beauty and culture while tapping into the good work ethic of the well-educated work pool available in Ireland. 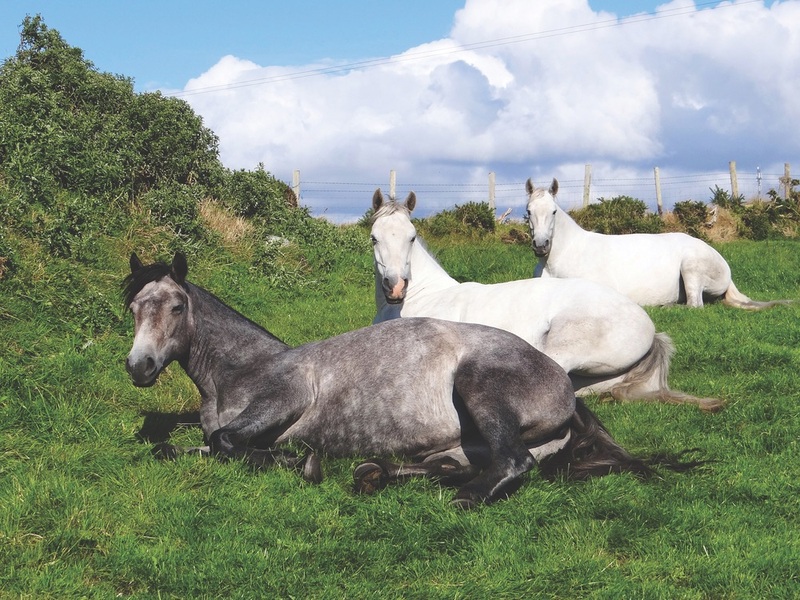 As part of that plan, The Idea Boutique is preparing to launch the Irish publication Connemara Life, which is due to publish in May 2015. The new office of The Idea Boutique, Ltd. officially opens September 15, 2014, in Clifden, County Galway, with Sharon Duane as branch manager. It’s an exciting time and I am thrilled to see what adventures lie ahead at the new satellite office in Ireland. 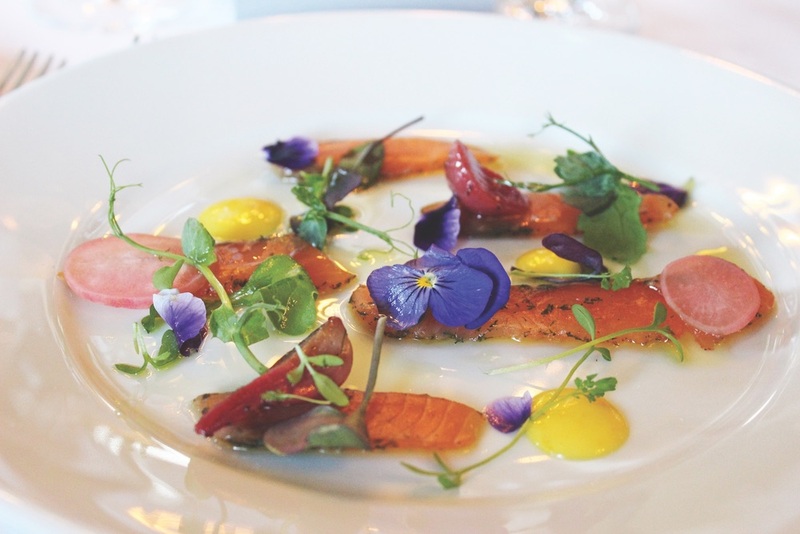 The company’s grand opening journey to Ireland as a whole was incredible, fantastic, and magical—something that you might only expect to read in a fairy tale. 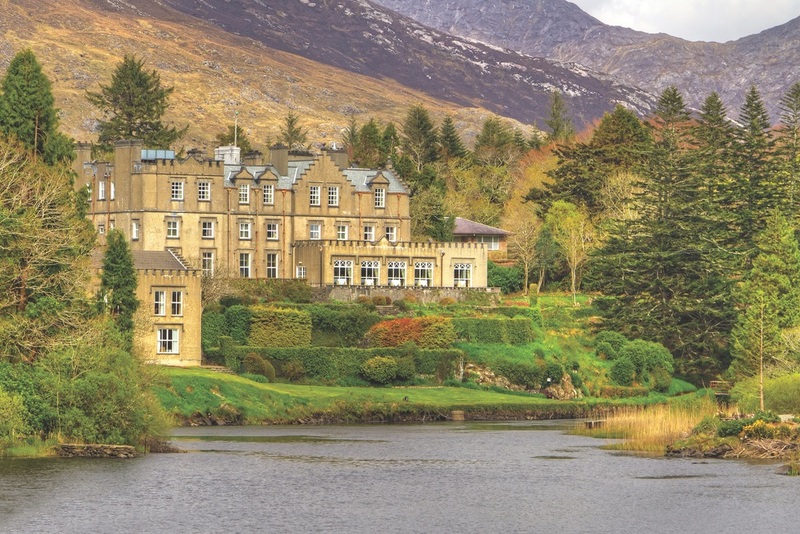 Learn more about the destinations throughout the trip in the article “Magical Connemara: Rugged Beauty at Its Finest” in the upcoming Travel Issue.